Keeping in mind this particular context, I want to briefly explore how the debate about the place of robots in society – and within the family unit in particular – plays out in Yasuhiro Yoshiura’s Time of Eve, originally aired a year after the introduction of Innovation 25 as a six-episode net animation and later released as a feature-length film in 2010. 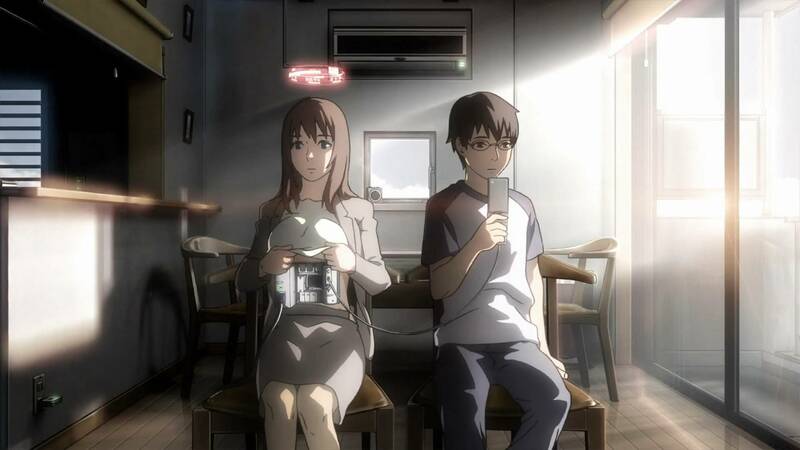 Time of Eve depicts a near-future Japan in which household androids have become commonplace. Virtually indistinguishable from humans in appearance, robots are required to wear identifying holographic rings above their heads (fig. 1). 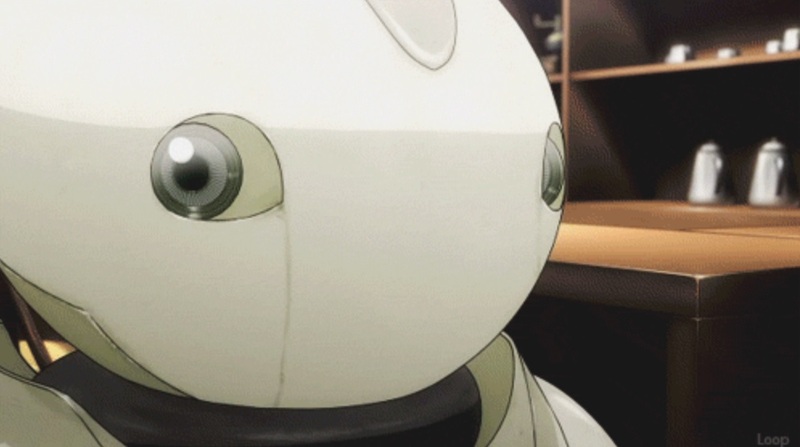 Despite being highly intelligent and (as the film slowly reveals) fully capable of experiencing emotions and creating art (among other traditional markers of humanity favored by sci-fi narratives), these service bots are denied personhood and viewed with indifference or open hostility by the majority of the population. The film’s name comes from its central setting, a robot-friendly secret café which allows members of this oppressed minority workforce to remove their holographic rings and interact freely with each other and with friendly humans. Fig. 1. Household android Sammy experiments with a new hairstyle, but is not permitted to remove the holographic ring identifying her as non-human. By delving into the personal stories of various café regulars (both organic and artificial), Time of Eve examines the cultural and moral ramifications of intelligent humanoids’ potential integration into contemporary Japanese families. From its very first scenes, which introduce the relationship between male protagonist Rikuo and his household android/surrogate caretaker Sammy (fig.2), the film positions robots as instrumental to the upbringing of an entire generation. Specifically, it repeatedly suggests the formation of a genuine, lasting bond between children and their homebots that transcends species and leaves a lasting emotional mark on both parties. Fig. 2. Protagonist Rikuo Sakisaka charges his phone with the help of his family’s household android. Time of Eve features several subplots involving robots serving as substitutes for absent or inattentive family members in order to provide both day-to-day care and emotional support. For the sake of brevity, I will single out the film’s emotional climax, which marks the resolution of a long-term misunderstanding between Rikuo’s friend Masaki and Masaki’s childhood homebot THX (a.k.a. Tex) (fig. 3). 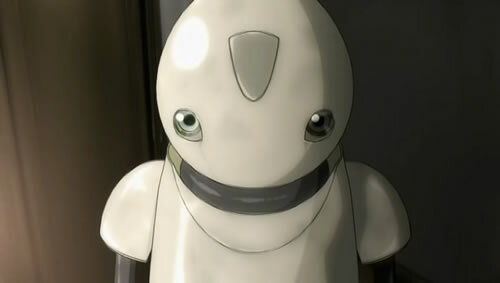 In a flashback, viewers learn that Tex had acted as young Masaki’s primary confidante and source of support during his parents’ divorce until Masaki’s father, a prominent anti-robot activist, ordered the robot to not speak to the child in order to sever their growing bond. Bound to obey as per Asimov’s famous Three Laws of Robotics (which are often quoted in the film), Tex never utters another word to Masaki. The robot – now fully reduced to the artificial equivalent of a blindly obedient housewife – continues to quietly take care of Masaki’s everyday needs, but can no longer attend to his emotional ones. Deprived of his surrogate parental figure, and largely ignored by his distant human father, Masaki grows up neglected and angry, developing resentment against robots due to their perceived failure to prioritize human emotions over programming directives. Fig. 3. THX (or Tex), the older, non-humanoid household robot Masakazu Masaki grew up with. 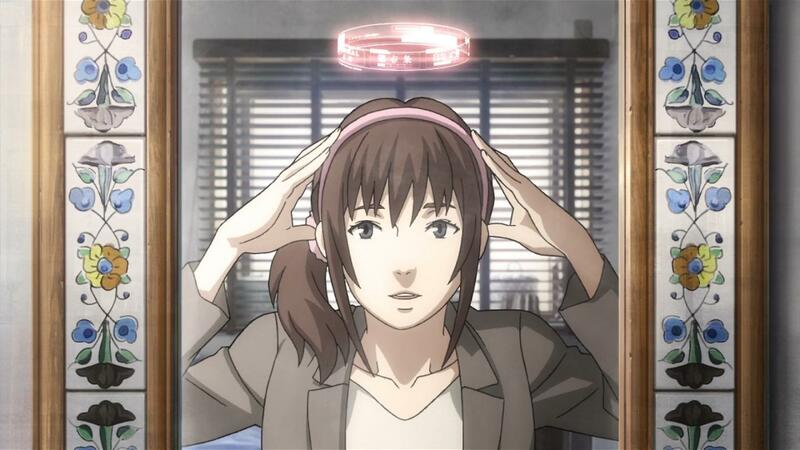 Having revealed childhood trauma as the root of Masaki’s anti-AI bias, the ending of Time of Eve marks a moment of reconciliation. After learning that Masaki is in danger, Tex is able to temporarily override the father’s original directive in order to protect Masaki. This allows the robot to finally speak, revealing that he, equally affected by his forced alienation from Masaki, has spent years yearning to regain their sense of familial intimacy. His confession – “though I was unable to speak to you, I always wished to remain with you” – further emphasizing both his loyalty to the human and the pain he feels as a result of not being able to act upon it. This cathartic emotional reunion is punctuated by a close-up of Tex’s face, which reveals twin marks that closely resemble tear stains (fig. 4). Fig. 4. The marks on Tex’s face evoke tears, enhancing the melodramatic mood of his reunion with Masaki. Fig. 5. 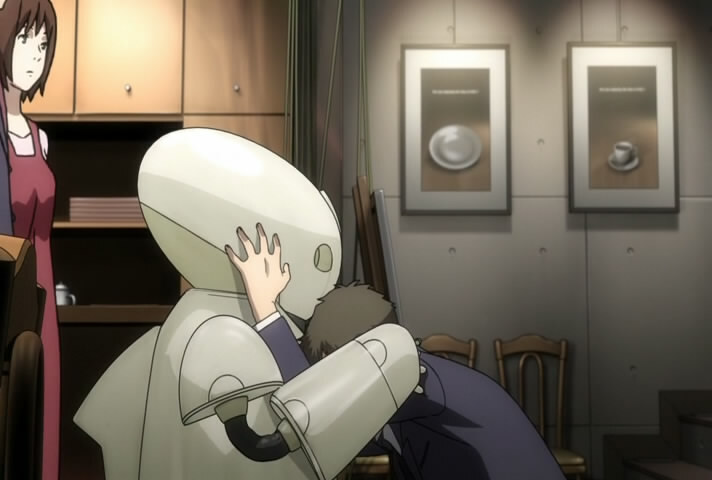 Masaki and Tex finally mend a close relationship all but destroyed by anti-robot bias. This scene invites its viewers to ascribe personhood to its homebots, perceiving them as complex beings capable of experiencing emotions and forming attachments. And yet, while Time of Eve is happy to flirt with subverting social attitudes towards AI, its melodramatic ending offers no promise of robot emancipation. Instead, it reinforces a vision of the posthuman family wherein harmonious coexistence and domestic bliss remain contingent on allowing the robots to fully embrace – but never stray from – their assigned caretaking role. Tex’s revolt against the will of Masaki’s father is short-lived, temporary, and – crucially – still entirely within the parameters of his programming. In the end, the robot remains bound by traditional patriarchal order, in both senses of the word. Given Japan’s leading role in robotics research and manufacture and the ever-increasing presence of entertainment and service robots on the domestic market, grappling with questions of virtual subjectivity, expanding definitions of personhood and agency, and the place of posthuman beings within the social structures of the country remains relevant and topical. Time of Eve, despite being somewhat dated already, is a productive starting point for understanding the anxieties, questions, and challenges that arise in attempting to conceptualize the potential of posthuman familial relationships. The film ultimately aligns itself with conservative views of advanced technology by upholding the role of caretaker robots as silent facilitators of patriarchal family structures instead of calling for robot autonomy. However, by thinking through these issues at least partially from the point of view of the artificial beings themselves and with attention to their complex emotional landscapes, Time of Eve opens up the conversation to posthuman perspectives. Mihaela Mihailova is an incoming Postdoctoral Fellow at the University of Michigan Society of Fellows, with a joint appointment in The Department of Screen Arts and Cultures. She has published articles in animation: an interdisciplinary journal, Studies in Russian and Soviet Cinema, Post Script: Essays in Film and the Humanities, and Kino Kultura. She has also contributed chapters to Animating Film Theory (ed. Karen Beckman) (co-written with John MacKay), Animated Landscapes: History, Form, and Function (ed. Chris Pallant), and the forthcoming volumes Drawn from Life: Issues and Themes in Animated Documentary Cinema (eds. Jonathan Murray and Nea Ehrlich) and Animation Studies Reader (eds. Bella Honess Roe, Nichola Dobson, Amy Ratelle, and Caroline Ruddell). Jennifer Robertson, ‘Robo Sapiens Japanicus: Humanoid Robots and the Posthuman Family’, Critical Asian Studies 39, no.3 (2007), p. 369.
i am a Animator myself i love to read blogs on Animation i really like your work i am following this blog as i appreciate this writing.